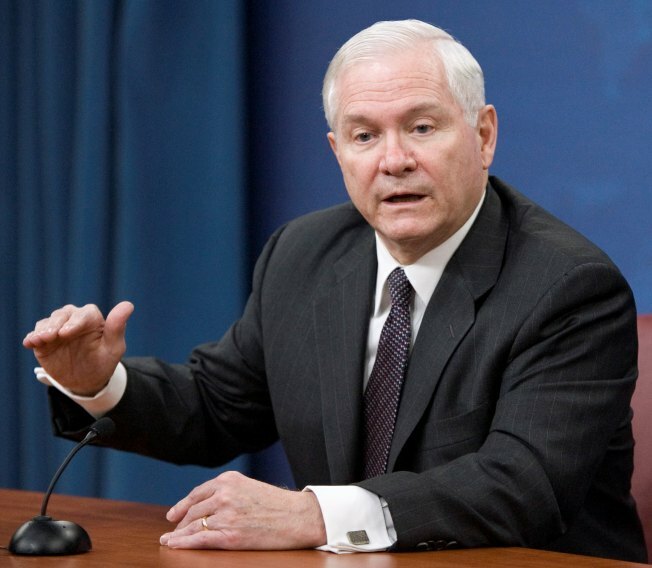 Defense Secretary Robert Gates is looking to make changes to the stop-loss program. The Army this summer will start cutting back on use of the unpopular practice of holding troops beyond their enlistment dates and hopes to almost completely eliminate it in two years. Defense Secretary Robert Gates said, though, that it may never be possible to completely get rid of the policy called "stop-loss," under which some 13,000 soldiers whose time is already up are still being forced to continue serving. "I believe that when somebody's end date of service comes, to hold them against their will, if you will, is just not the right thing to do," he said, noting that officials will still retain the legal power to involuntarily extend soldiers' service if needed. "I felt, particularly in these numbers, that it was breaking faith," Gates told a Pentagon news conference. He said that he hoped any future use after 2011 would only be in "scores, not thousands." Critics have called "stop-loss" a backdoor draft because it keeps troops in the military beyond the end of their enlistment or retirement dates. But the military has said it's a necessary tool to keep unit cohesion in times of war and to keep soldiers with certain skills needed in those units. Soldiers and their families strongly dislike stop-loss and it was the title of a 2008 Hollywood movie in which a soldier who served in Iraq goes AWOL rather than following orders to stay longer in the service and return to combat. Rep. John Murtha said earlier Wednesday that 185,000 troops had been forced to stay in the military since the Sept. 11, 2001 terrorist attacks under the policy. He said the military had agreed to begin $500 monthly payments to troops serving under stop-loss. The payments are planned to soften the effects of the practice, which makes it impossible for troops to make lasting work and family plans. "This is a victory for soldiers and their families," said Sen. Frank R. Lautenberg, D-N.J. "After months and often years of risking their lives, our troops deserve to know when they will return home. The military made a deal with our men and women in uniform and will now live up to that commitment." To be fair, the Army is also planning to pay a still-undisclosed amount of extra money to those who extend their services voluntarily. The policy can keep a soldier in service if his or her unit deploys within 90 days of the end of the soldier's commitment. The time soldiers have been held in service has averaged five to eight months, officials said. The Army has said 1 percent of the Army is affected by the forced extensions. As of January, the roughly 13,000 soldiers on stop-loss included 7,300 active-duty Army, about 4,450 in the Guard and 1,450 reservists. Under the Army plan approved by Gates, the Army Reserve in August will begin mobilizing units that don't include stop-loss soldiers and the Guard in September will do the same. The active duty Army is to deploy its first unit without stop-loss in January, he said. The goal is to reduce it by 50 percent by June 2010 and end its regular use by march 2011. Though the practice has been virtually ended in all other service branches, the Army has said it still needed to use it as remained under severe strain fighting the two ongoing wars in Iraq and Afghanistan. "We would be off stop-loss tomorrow were it not for the demand for Army forces worldwide — not just in Iraq and Afghanistan — worldwide," Lt. Gen. Michael Rochelle, head of Army personnel said in a separate Army press conference later. He said President Barack Obama's decision to draw down troops in Iraq has taken off some of the pressure. Officials say it is possible to gradually reduce the number of stop-loss soldiers now also because the Army has grown, retention is good, and officials are changing the way new units rotate — something that gives units scheduled for combat more time to get the people with the skills they need as opposed to holding in service soldiers who have that skill. The most needed skills are in infantry. Officials acknowledged that there is a risk without stop-loss the Army would not have enough troops if another emergency arose — such as deterioration of the situations in Iraq and Afghanistan. Effective this month, troops will get $500-per-month payments for extending their service and it will be made retroactive for those who were on the stop-loss roles as of last Oct. 1. Payments before were not possible, officials said, because Congress did not appropriate funds for that. The costs for the payments for the budget year that began Oct. 1, 2008, are about $72 million.